Did you know you can stencil with stain? 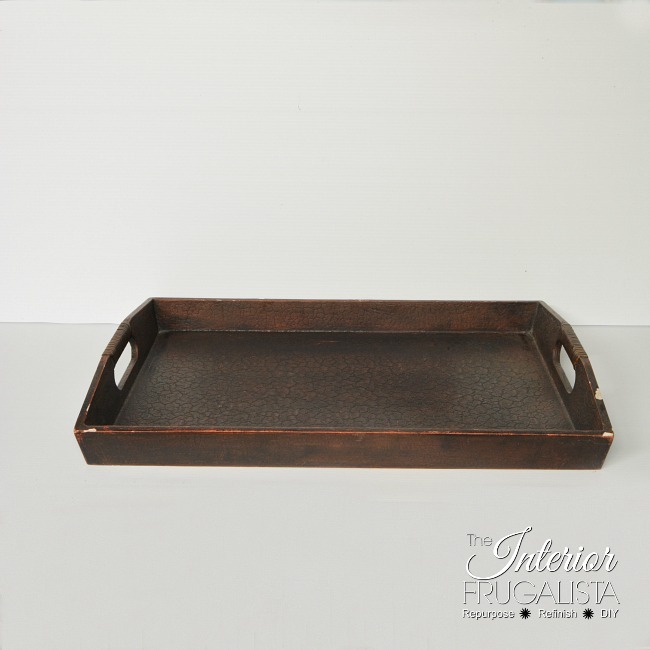 I didn't until I gave it a try on a Faux Snakeskin Wood Tray. But that wasn't the original plan. The original plan was to repair the chipped wood, paint it brown, and decoupage the top with coffee napkins that I picked up at the dollar store. But no matter which way I tried to lay the napkins, the repetition in the pattern didn't line up nicely. Instead of painting the wood I decided to refresh it with Saman Canadian Maple water-based wood stain. 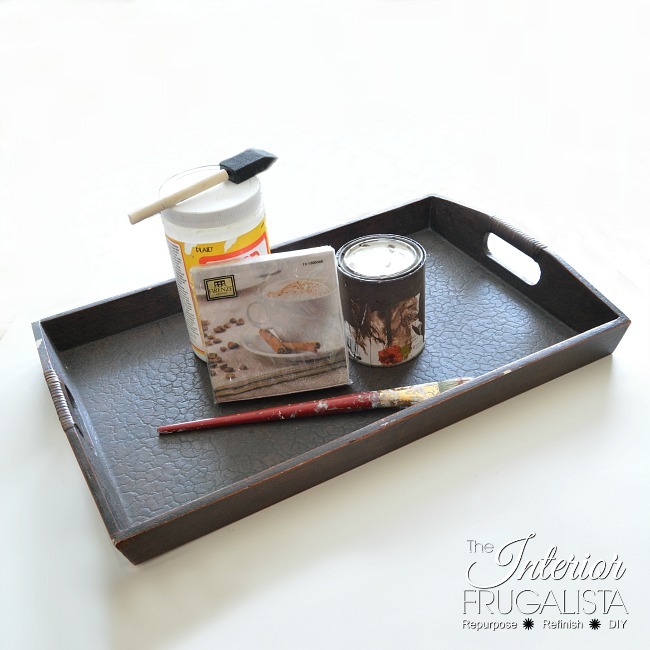 To make the tray pop I painted the base with Annie Sloan Chalk Paint in the color Old White. Because of the dark stain underneath, I was expecting to have paint bleed but to my delight, there was none. It took two coats for full coverage. I dry brushed old white onto the rattan wrapped handles as well. 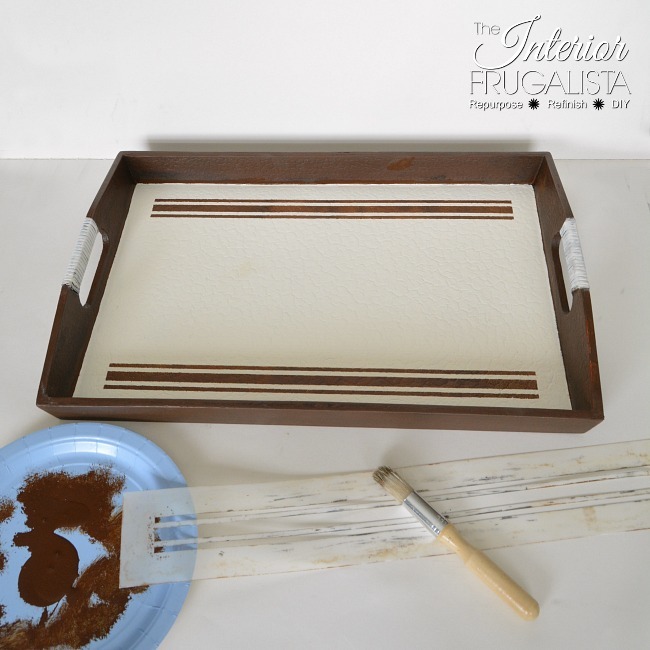 The plan was to use my Homestead Blend Coffee Stencil using brown chalk paint but then I wondered what if I used the stain I refreshed the tray with? And it worked and I'll tell you how. The process is exactly the same as when stenciling with paint. Dab the stencil brush into the water-based stain. Offload the excess stain onto a paper towel. When the stencil brush looks almost dry, pounce or swirl the brush in a circular motion until you get the desired coverage. NOTE: This is a water-based stain and should be stenciled over a porous paint like chalk or milk paint. Wait for at least 24-hours before applying a clear protective top coat over the stain. I used Clear Coat by Dixie Belle Paint Company. The trick to applying clear coat is that you use a damp (not saturated) paint brush and apply a thin layer in just ONE stroke (do not use back and forth motions). It will be dry in an hour and repeat with a second coat. 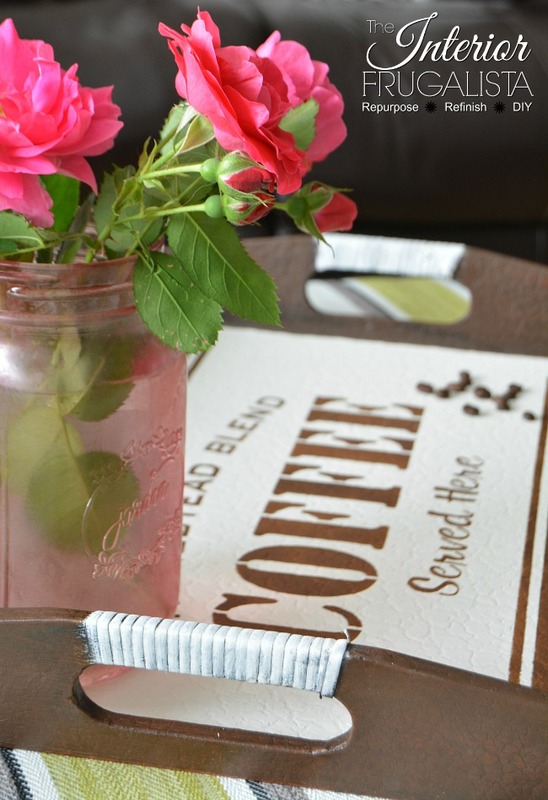 I'm determined to find a project to use the coffee napkins originally intended for this tray. I have a few ideas up my sleeve so stay tuned. In the meantime, I think this beat up thrift store tray looks pretty darn good stenciled with stain. 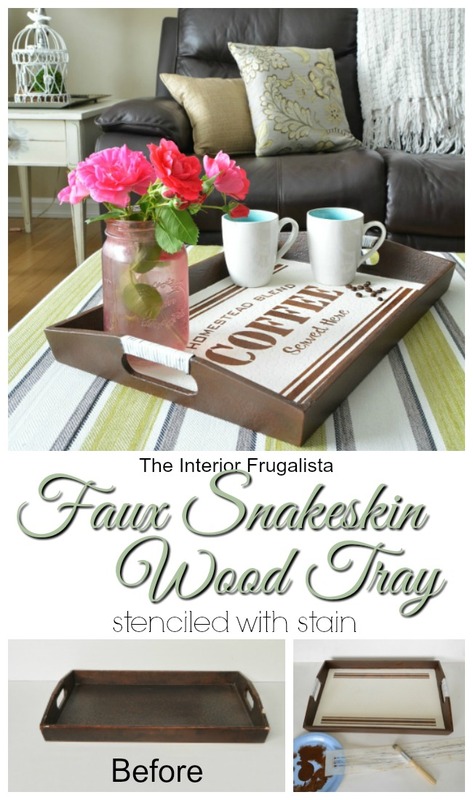 If you like my Faux Snakeskin Wood Tray Makeover, please share it with a friend and/or save it on Pinterest. 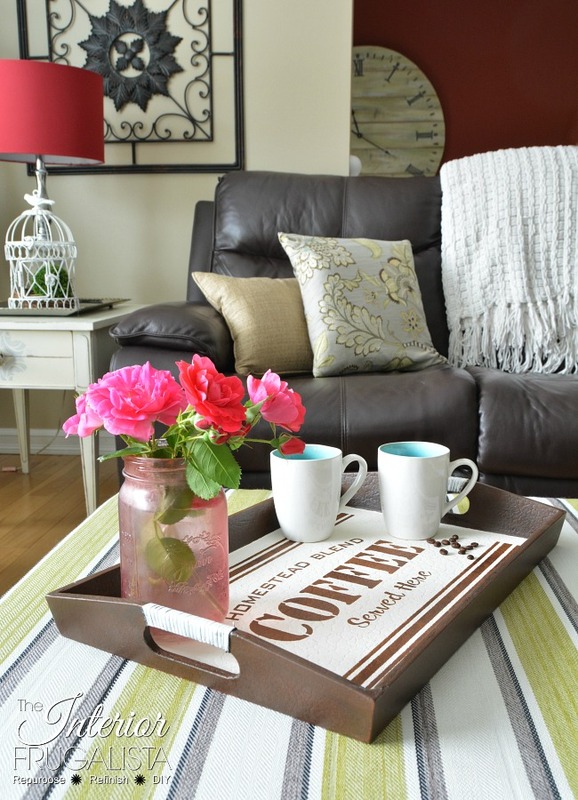 Here are some other tray ideas if using stain isn't your cup of tea...ahem...coffee. 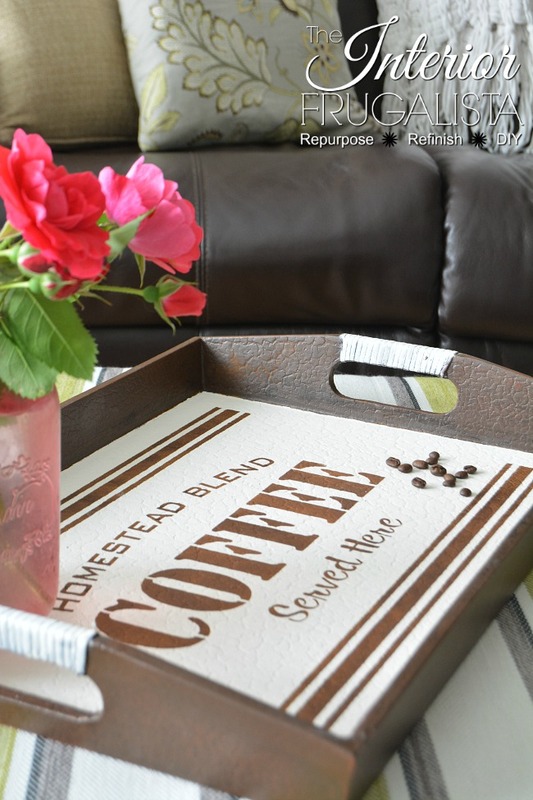 Like this Rustic Homestead Blend Coffee Tray or this Large Thrift Store Coffee Tray. 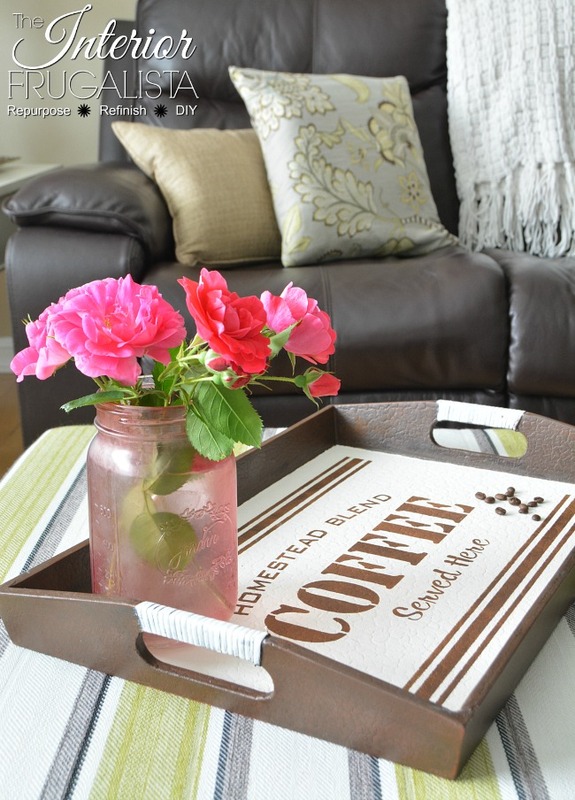 I also built a simple Farmhouse Coffee Tray and share step-by-step instructions on how to make it. One can never have enough trays around the house, right? 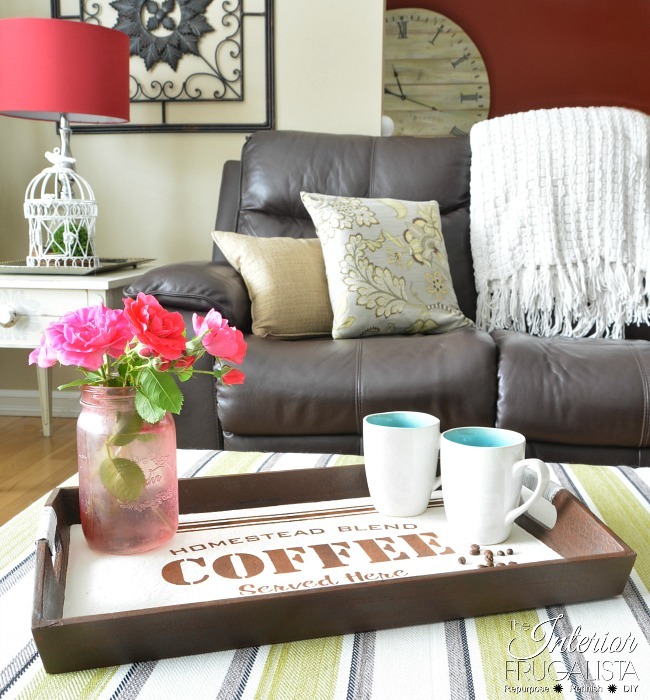 So would you give stenciling with stain a try?